In 2002, a survey conducted by Sri Lanka Business Development Centre (SLBDC) on ‘E-commerce Implementation In The SME Sector of Sri Lanka’. The survey findings indicated that the penetration level of eCommerce web development in Sri Lanka is very poor when compared to other countries. The survey identified several reasons why Sri Lanka is lagging behind in this area when businesses in the rest of the world are thriving with online mode of selling their products and services. One of the reasons identified was the challenges involved in finding companies that offered low-priced E Commerce Website Development company and finding dependable web design service providers in Ceylon. Unfortunately even after a decade, Sri Lanka is still lagging behind in the e-commerce race. The same survey went ahead to offer its recommendations to the Sri Lankan businesses. Entrepreneurs have been encouraged to engage in online activities and to start selling goods over the internet as it can pace up the growth of the local businesses. 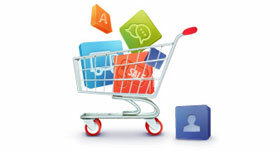 Setting up e-commerce websites will help both small and medium businesses to make global stature. Businesses will be able to compete with their counter parts from the other countries and take active part in the global competition, which in turn will boost the profit levels enjoyed by Sri Lankan businesses. The report also encourages businesses to carry out business planning that will merge E Commerce activities so that they can enjoy better benefits from all their future investments. How to Set-up E Commerce Websites in Sri Lanka? If you are a business based in Sri Lanka, you are likely to wonder how to set up a shopping cart website in Ceylon and how to start selling your products or services locally as well as globally. The first step in the setting up of a website for your business is to find a dependable web design service provider and discuss your requirements on E Commerce website development. Here are few important factors that you need to take into account while choosing your web design company. It is vital that your web design company or your E Commerce website development service provider possesses adequate experience in setting up e-commerce applications for websites. Experienced service providers will be able to understand your requirements fully and they will be able to set up online stores that suit your niche industry. Moreover, experienced web design and web development companies will be able to give you fully customized solutions that meet your specific requirements. The next important factor that you should consider while choosing your web design company is whether your service provider enjoys good reputation in the industry for offering the best e-commerce website development in Sri Lanka. Number of other factors are covered here for example, only a company that offers good quality web design and web development solutions will be able to enjoy good reputation. Secondly, only companies that offer deadline oriented services will be able to enjoy good reputation. So when you are trying to find a service provider that enjoys good reputation in the industry, you are also making sure that you are dealing with a company that offers prompt and highest standard web design services. The next important factor that you should take into account while selecting your web design Sri Lanka service provider is the overall cost involved in setting up your on-line store. Each service provider is free to set their own rates for on-line development industry in Sri Lanka. You should take time to review and compare quotes. When you are comparing your quotes it is vital that you take into account all the factors discussed above along with the cost so that you will be able to find the best web design company at the most reasonable rates. With adequate efforts, you will be able to find top class E Commerce website development service providers in Sri Lanka. By setting up your e-commerce website or by taking your business online, you will certainly be able to increase your brand visibility not only in the local markets but also in the international markets.